Disney Comics Randomness: Unknown British print of "Christmas on Bear Mountain"
Unknown British print of "Christmas on Bear Mountain"
Nothing is more irritating than to buy a second hand comic only to discover that some of the content is missing. Usually this is soon forgotten, but one case has been bugging me for years! 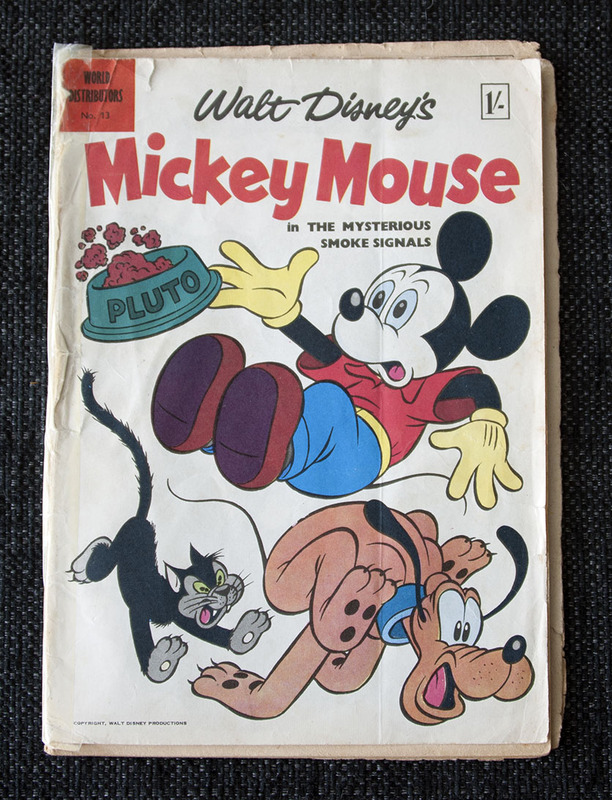 As part of a lot, I got this British Mickey Mouse comic published by World Distributors. I already got another copy of this comic, so at first it didn’t bother me that much. But curious as I always am, I tried to figure out where the extra pages came from, and that’s where the mystery started. The stories are easy enough to identify. The Mickey one is The World Under the Sea from Dell Four Color/One Shots #194, and the one with the ducks is the Barks classic Christmas on Bear Mountain. 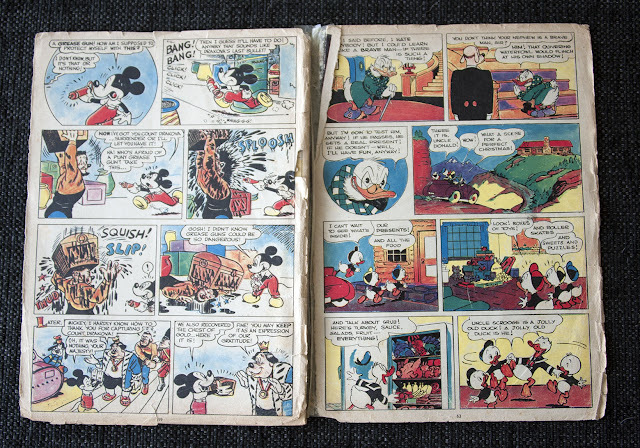 The page numbers are 59, 60, 63, 64 and judging from what pages of the stories they are, both stories seems to be from the same comic; printed after each other. I tried to do a search in the I.N.D.U.C.K.S. database, but no comics are known to have both these stories printed. At least not in English. While trying to solve the crime done to this comic, I noticed the word "jolly". That got me thinking "did Barks really write that?" Comparing to the original he sure didn’t, and the dialogue is clearly changed to be more British. So, like the issue the pages are taped on to, the extra pages are probably from a British publication too and not from an American import. The dialogue change got me even more curious. Now it’s not enough to just know where the mysterious pages came from, I really want to read the British dialogued version of the story too! I suspect it’s printed the late 50’s or in the 60’s. The fact that the comic has more than 64 pages got me to think about Giant Super Mag, another British series from this period. But based on size and paper type I think I have to rule out any unknown issues in that series. If anyone got an idea about what comic the orphan pages are from, please let me know! Update Feb 25, 2016: The mystery is solved, check the comments! Apparently the pages are from a British book called The Walt Disney Treasure Book, published by Odhams Press. 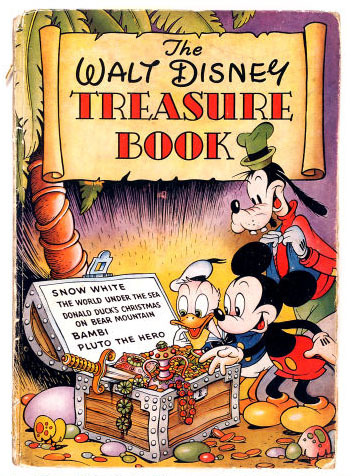 The lettering in this book was partly used to restore "Christmas on Bear Mountain" for Fantagraphics’ Carl Barks collection, resulting in one British word being included by accident. So Fantagraphics' version is partially based on the British version with altered dialogue rather than the original American version? Weird. Anyway, I hope that book will be added to Inducks soon. Thanks a lot for solving this mystery! At least I know what book to look for now, but I have a feeling it’s going to be hard to find. I found the British word in the Fantagraphics print :). On page 12 of the story, one of the boys originally says "Listen! I hear roller skates in the parlor!". In the Fantagraphics book he says "parlour" (without the exclamation mark) instead. Also, from the example I posted above, the Fantagraphics coloring is actually closer to the British version, as the lobster is colored red there. Anonym: It’s not that strange. As the originals are lost, you’d have to track down the best possible source to get a good reprint. If the lettering in the British print is sharper than any other source it makes sense using a scan of that, even if you can’t use all of it. The parts that are not changed are still identical to the original lettering. Well—the originals weren't lost. 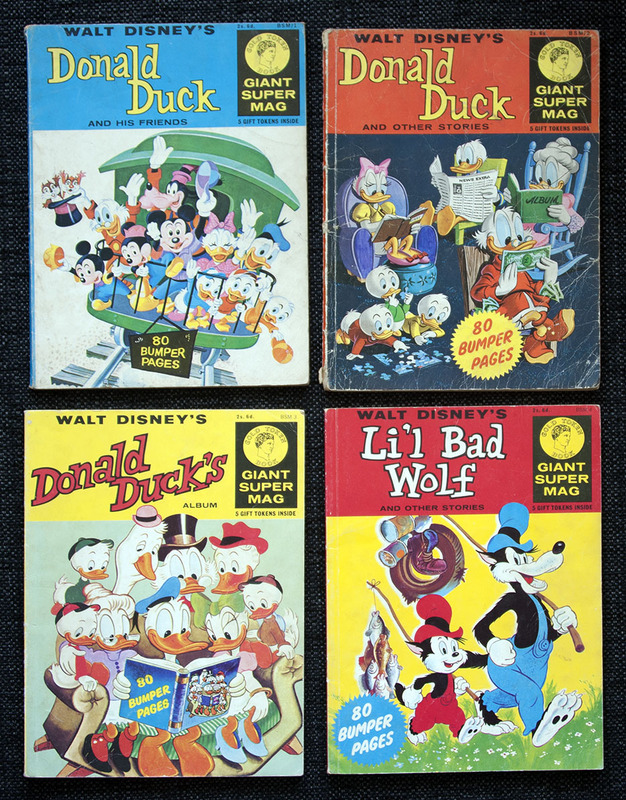 All printings of "Bear Mountain" since 1947 had been produced from surviving printing proofs. But... all surviving proofs in English were rather dark and muddy, leading to rather messy looking lettering on almost every reprint up until now. Fantagraphics wanted a source for sharper lettering to cut and paste into the art, and the British printing was it! I get that sometimes it is better to use an edited version in good quality as the base source instead of the original but dark/muddy version. It won't show Barks' original letering, but it can't be helped. By the way, where does this scan come from? It has Barks lettering (including "parlor!") and yet the quality is very good, without being dark or muddy. David, do you think you can take care of adding that book to Inducks? I would do it myself, but I don't have it and I don't even know any information about it. 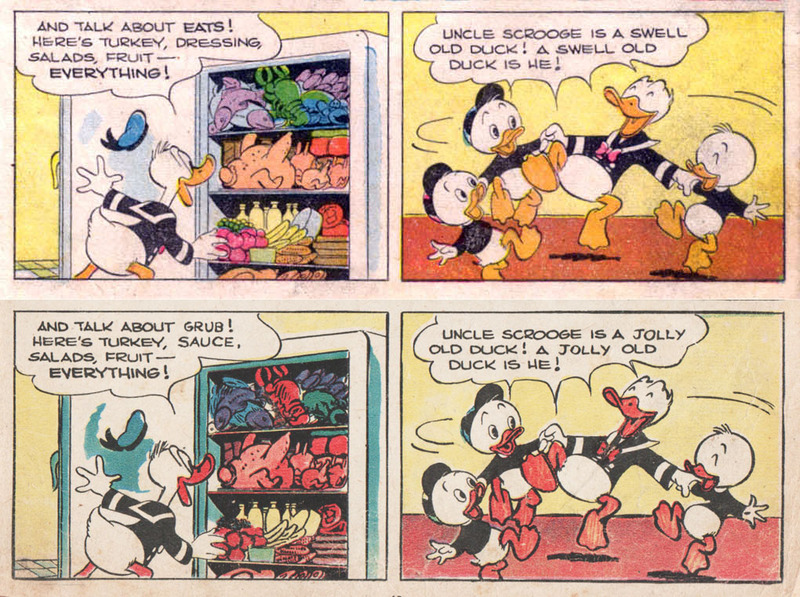 That scan comes from one of the 2000s printings of the story—likely either UNCLE SCROOGE 372 or CHRISTMAS CLASSICS 1. And actually, the lettering is still the rather muddily reproduced type that Fantagraphics wanted to replace: notice that the dialogue in pics 5 and 8 has been worked over by hand to tone down smudging and smearing. Thanks for the answer, I didn't notice that.